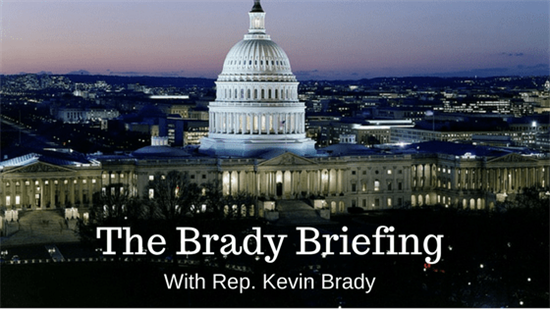 The Brady Briefing is a regular feature of USA Daily Times. In this issue, Rep. Kevin Brady (R-TX) reviews further tax reform, energy costs, education issues, and more. August is my favorite time of the year because it means I get the opportunity to spend more time back home with you and the great folks of District Eight. This district work period – I have already hit the ground running – meeting with local businesses on the benefits of Tax Reform and receiving input on issues important to you, your family and our communities. The Lone Star State is truly proof that Tax Reform is working. In Texas alone, over 160,000 new jobs have been created and hundreds of businesses have announced investments in their workers, in new equipment and in their facilities. Here at home in District Eight, folks are seeing big savings. Just last week, I had the chance to meet with local franchise business owners and hear about how Tax Reform has helped them grow and thrive. Dale Busic, CertaPro Painters franchise owner, told me his employees are putting their hard-earned tax cuts to good use. Weather it’s a lift on your pickup truck or a down payment on a house, you get to spend more of your hard-earned money the way you want because of Tax Reform. One of the reasons I am leading the charge for Tax 2.0 is to provide local businesses like CertaPro Painters, long-term certainty and more growth. From spurring innovation by allowing new businesses to write off more of their initial start-up costs to promoting family savings and locking in tax cuts, Tax 2.0 is about ensuring we always strive for better. Because when our businesses are strong and growing here in America, ultimately everyone benefits. Summers are hot in Texas but 2018 has undeniably been a scorcher! That means record demands on the power grid. I know I always see a big jump in my electricity bill because of air conditioning costs. Fortunately, since Tax Reform passed, over 100 utility companies across 48 states have lowered their rates. In our very own backyard, Quadvest lowered rates for all customers – almost 30,000 people in Southeast Texas. I enjoyed touring their facility and getting the chance to talk with their leadership and employees who work hard to keep our utilities running smoothly and the water flowing. Backpacks, binders, pencils, and more. It’s back to school time. And educators, students, and families are benefitting from the new tax code. We preserved the Educator Expense Deduction so our teachers can continue to write off some of the expenses for supplies they buy for their students. Families also benefit from the doubled Child Tax Credit –$2,000 for each child – and expands it to more families across the country, providing crucial support to parents who are raising children. The new tax code also maintains the American Opportunity Tax Credit, which makes it easier to afford the costs of going to college or vocational school. My son, Will, just finished his first year at Lone Star Community College and is a certified Welder. Quality education is vital to ensuring a brighter future for our children and our country and these are a few of the many ways the Tax Cuts and Jobs Act supports our nation’s teachers and their students. Just a quick reminder that my team and I are here to serve you. Whether you’re having trouble with a government agency, or looking to get a tour of the Capitol when visiting Washington, D.C., we are here to help. Please visit KevinBrady.House.Gov to learn more about the constituent services we offer. Kevin Brady is Chairman of the powerful House Ways and Means Committee. Congratulations to these hard-working young people! Our #PictureoftheWeek features caseworker Vita Swarers and WWII Veteran Jack Kelley from Centerville!